Next, I stuck a length of resistance wire along the bottom of each sole using the sticky-backed plastic, paying extra attention to the toe area where my feet get coldest. The resistance wire I used came from Maplin and has a resistance of 4.2ω/m. 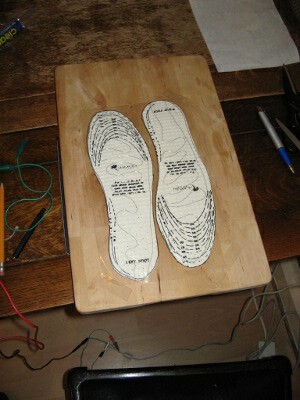 I used about 1.25m in each shoe for a total combined resistance of 10.6ω. I was planning on using a 12V supply which means a current draw 1.14A. Power disspiated (in Watts) = current x voltage so the power would be about 1.14A x 12V = 13.7W, or around a nice and toasty 7W per foot. 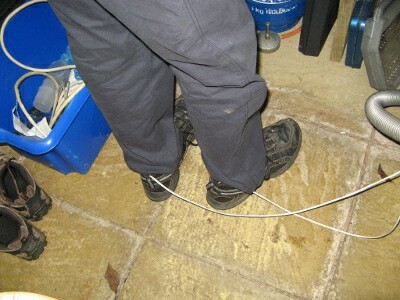 I was guessing the specs a bit as I didn't really know how much power I would need to keep each foot warm. As it turns out, my guess was about right and neither burns my feet nor becomes uncomfortably hot after prolonged use. After leaving a couple of connections to each heel, I soldered a metre of bell wire to each sole. 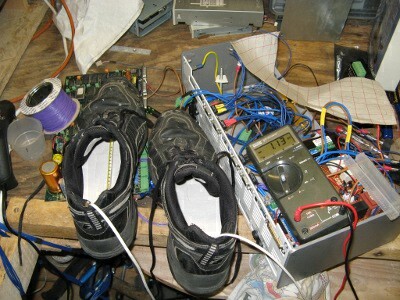 I joined the shoes in series and connected them to a 12V supply capable of supplying the required current which I have salvaged from some piece of electrical junk in my past. Putting a multimeter in series shows that the shoes are drawing 1.13A, pretty close to the designed 1.14A. The thermometer in the left shoe was just to check that I wasn't going to burn my feet. Of course, the final test is whether they work as intended which I'm glad to report that they do. The obvious design flaw (i.e. that there are a pair of wires from your feet) isn't really a problem in a shed that measures less than 2.5m on each side as I spend most of my time stationary or moving only short distances. An improvement would be to run them off a rechargeable battery pack. Perhaps something for the future. The total cost was a couple of pounds for the insoles, about £1.50 for sticky-backed plastic and a few pence for the resistance wire. The total build time was less than an hour, including testing. Published on 15th November 2012.